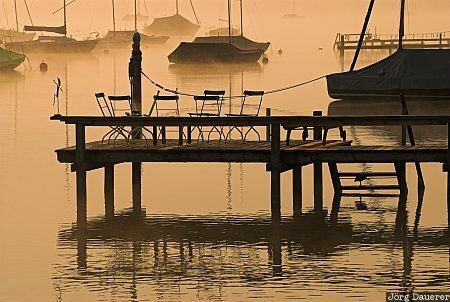 Morning fog, silhouettes of boats and a pier near Seeshaupt at the southern end of Starnberger See. Seeshaupt is south west of Munich in the county of Oberbayern, Bavaria, Germany. This photo was taken in the morning of a sunny day in August of 2007. This photo was taken with a digital camera.